Incident Details: A local lady walking in Wythburn, slipped on muddy ground and suffered an ankle injury. 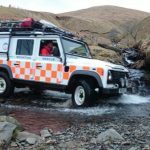 The Team was alerted by North West Ambulance Service, and a Team Land Rover with 5 members set off immediately. Communications in that area are frequently difficult, and it took some time to establish an exact location. The casualty was found fairly swiftly, and First Aid was administered, while further team members made their way up. Fortunately, the Great North Air Ambulance was available, and it turned up to airlift the casualty down to West Head Farm, where some extra Team members assisted in transferring the lady into a road ambulance for transfer to the Cumberland Infirmary.